Equine Athlete Veterinary Services is an exclusively-equine practice designed to cater to the needs of the equine athlete, at all stages of life. Providing full service care at your farm or event, Equine Athlete has doctors based in California, Michigan, and a hospital located in Pilot Point, Texas. Our veterinarians travel nationwide throughout the year, offering our services for pre-purchase exams, consultations on complex lameness and medical issues of the equine athlete, preparing performance horses for competition, and managing their health care at horse shows. Making ourselves available in this capacity gives our clients the competitive advantage of continuity of care for each individual horse. Equine Athlete insists on remaining at the cutting edge of equine sports medicine through continually advancing our education and utilizing the latest in digital diagnostic technology. We have extensive experience with regenerative therapies including stem cells, platelet rich plasma (PRP), and IRAP II; we often combine these techniques with the elective surgical services we also provide. Dr. Hill’s experience includes a sports medicine internship and subsequent associate position with Merritt and Associates Equine Hospital between 2003-2007. Since 2007, Dr. Hill has been based in the Greater Lansing area in Michigan practicing veterinary medicine, specializing in lameness, sports medicine, pre-purchase exams, and second opinion consultations of the performance horse. Dr. Hill partnered with Dr. Wallis in 2012 and co-founded Equine Athlete Veterinary Services. He travels to equine training facilities across the country to diagnose, treat, and consult on the medical issues facing today’s equine athlete. He is also a partner in Michigan Equine Surgical Associates. Dr. Wallis’s experience includes a one-year internship at Oakridge Equine Hospital in Edmond, OK, followed by a three-year residency and combined masters program in equine surgery and lameness at Colorado State University Veterinary Teaching Hospital in Ft. Collins, CO. He became board certified in large animal surgery in 2009 and is a Diplomate of the American College of Veterinary Surgeons. He practiced in Tennessee and South Carolina and ultimately teamed up with Dr. Hill. Dr. Wallis partnered with Dr. Hill in 2012 and co-founded Equine Athlete Veterinary Services. In 2014, he moved back home to Texas and is currently based in Pilot Point, where he focuses on lameness, sports medicine, pre-purchase exams, and orthopedic surgery of equine athletes in training centers throughout the country. He has also been the surgeon for Michigan Equine Surgical Associates since January 2012. He is a member of AVMA, AAEP, ACVS, ISELP, AHA, APAHA, and is an Arabian Show Horse delegate to the AAEP Performance Horse Task Force. Dr. Krystle O’Cull is originally from Southern California, however elected to attend veterinary school abroad in Ireland. She completed an internship with Equine Sports Medicine and Surgery in Weatherford, TX. Dr. O'Cull joined the Equine Athlete team in 2014 as an associate veterinarian. Her practice focuses on lameness, sports medicine, and show horse medicine. In 2018, Dr. O'Cull expanded our practice to the West Coast, relocating to Southern California. Dr. O’Cull’s passion and dedication to today’s equine athlete have only grown since she joined our team, and we are proud to have her continue to represent Equine Athlete Veterinary Services. Dr. O’Cull schedules regular visits to Scottsdale, Arizona and Northern California. Dr. Jessica Bush grew up in the Houston area working as a veterinary assistant and competing in the local barrel racing circuit. She attended Tarleton State University for her undergraduate studies and Texas Woman's University for her MBA. After earning her Doctor of Veterinary Medicine degree from Texas A&M University, Dr. Bush completed an internship at Oakridge Equine Hospital in Edmond, Oklahoma. She joined the Equine Athlete team in 2015 as an associate veterinarian. Her interests include sports medicine, emergency management, and regenerative therapies. 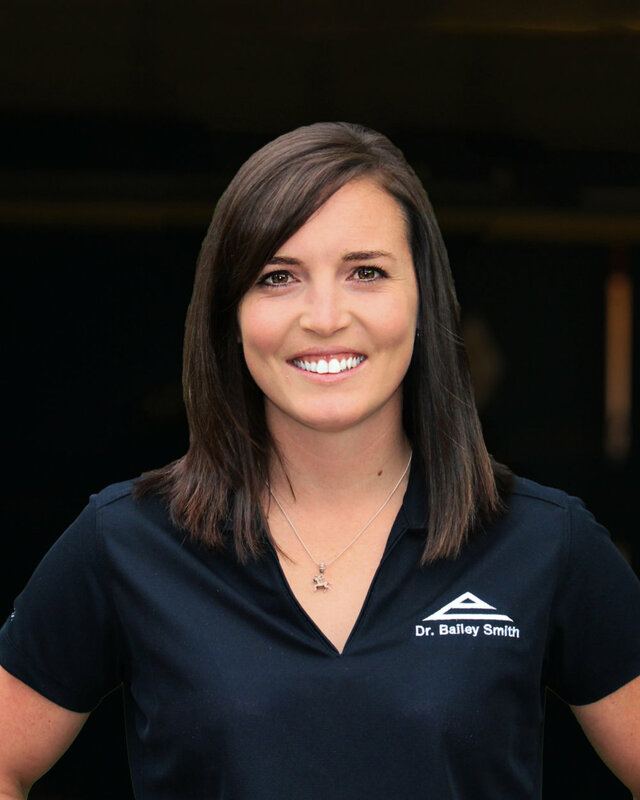 Dr. Bailey Smith grew up in Alberta, Canada on a performance horse operation where her family raised Quarter Horses and Hanoverians. She has always been involved in equine competition from hunter jumpers to cutting horses, however she has been most active in barrel racing and rodeo events competing in collegiate and semi-professional events. Dr. Smith completed her Bachelor of Science in Agriculture at the University of Alberta and her Doctor of Veterinary Medicine degree at the University of Calgary. She completed a one-year internship in equine medicine and surgery at Moore Equine before joining Equine Athlete as an associate veterinarian in 2017. Her interests include lameness and sports medicine, rehabilitation and general practice. Dr. Andy Walker earned his Bachelor of Arts degree in Biology from Westmont College, Santa Barbara, CA. He then went on to Veterinary School at the University of California, Davis where he graduated in 1996. Before having the opportunity to work in Texas, he spent his first 17 years in practice as a partner in a multi-doctor practice in north San Diego County, Southern California, followed by three years in Sheridan, Wyoming. Dr. Walker brings with him an enduring focus and proficiency in the fields of equine lameness diagnosis, pre-purchase exams, dentistry, and the use of regenerative technologies and rehabilitation for athletic injuries. Dr. Walker is the lucky father of six children, ranging in age from 11 to 21. When he’s not working, you’ll most likely find him on a baseball field with his family. Dr. Ali Judah is originally from Louisville, Kentucky, where she grew up riding and showing American Saddlebreds. Ali has competed throughout the United States, as well as internationally as a member of the USA Saddleseat World Cup team. Dr. Judah received her Bachelor of Science in Biology from Centre College in Danville, KY and her Doctor of Veterinary Medicine from Tuskegee University. After veterinary school, Ali completed a one-year equine internship with Fairfield Equine in Newtown, Connecticut before joining Equine Athlete in 2018. Her interests include lameness, sports medicine and rehabilitation, show horse medicine, as well as general practice.